Stephen Vitiello and Taylor Deupree’s Captiva consists of 3 pieces created while in residence at the Robert Rauschenberg Foundation’s new Rauschenberg Residency Program at his estate and studio compound in Captiva, Florida. The first record, “From the Fish House,” captures a series of duets, recorded in a small guest house, perched above the bay of the inland waters of Captiva Island. Microphones were mounted inside and outside the room, allowing the environmental sounds of osprey, pelicans and water to naturally enter the mix. The primary instrumentation here is modular synthesizer, samples, electric guitar and found objects for percussion. If there’s a missing sound that could never be captured, its the sound of porpoises circling the Fish House, quietly breathing… a moment too fleeting to ever make it to tape, although attempted on many occasions. While the first record was recorded during sunny afternoons, the tracks on the second record, “From The Main Studio” and “Last Piano (for RR)” were recorded during late night sessions in a vast reverberant work space, which the artist Robert Rauschenberg used as a multi-purpose production studio. In the far corner of the room, near giant doors opened to the quiet evening darkness, a baby grand piano sat, waiting to be played. 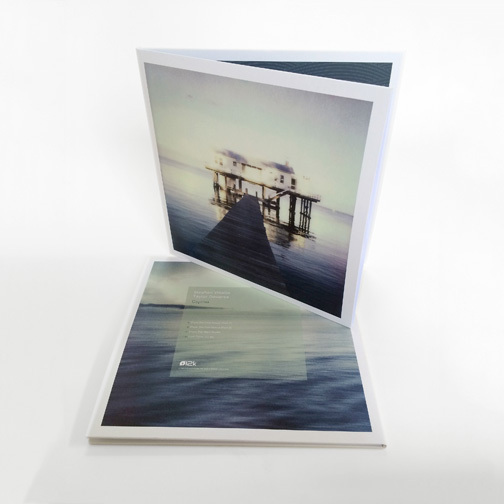 Tracks on these pieces include the piano played with Ebows and prepared with forks and local beach shells as well as synthesizers and guitar. Many of the sounds were amplified and re-recorded in the room. The presence of Rauschenberg’s history and maybe welcoming ghost were always felt… if possibly not heard. 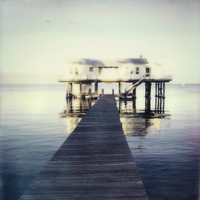 Captiva is presented as a beautifully realized double-10” album graced with a pair of Polaroid photographs from the artists taken of the Fish House and its surrounding waters. The audio work and their photography was shown at the Rauschenberg gallery space in Chelsea in New York City in 2013. This is the duo’s first full-length collaborative recording following a series of performances, a song recorded with Ryuichi Sakamoto and a multi-channel sound piece for the touring exhibition, With Hidden Noise, organized by Independent Curators International.